Show season is here and many of Blue Buddha’s customers are busily working on replenishing their inventory, pricing and tagging jewelry, and planning their booth layouts for the summer show season. I’ve done craft shows for nearly a decade, and each time I do a show, I learn something. Over the years, sales have increased significantly at my booth. While some of this is due to repeat customers (gotta love the die-hard fans—they are so amazing and sweet! ), additional increases are due to some of the tweaks to my booth. What a long way I’ve come from my very first show, when I didn’t accept credit cards, nor did I even have a table covering! I’d like to share some of these tips with you. 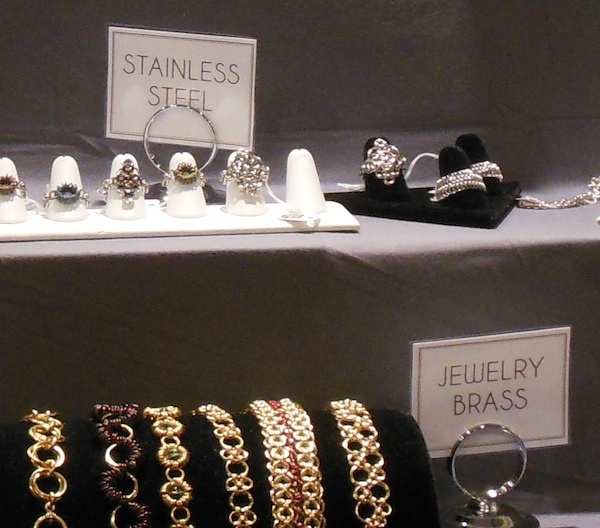 This article is the first of our 5-part series – Behind the Scenes at a Craft Fair. Having a show piece is great. By this I mean, your most extraordinary piece of work, the piece that is so utterly amazing it causes people to stop in their tracks and say, “wow!” Such a piece shows off your skill, and let’s face it, everyone likes a winner! Potential customers want to purchase a piece of your creativity: even if they cannot afford the show piece, they can afford a similar smaller and less intricate piece, and they still feel as though they are getting a piece of your talent for themselves. However, I learned that putting my show piece, Posiedon’s Embrace (shown at left) up and front ALWAYS invited the question “How much is it?” and once people found out the price, they would move their hand away as though they’d touched a hot stove and back away without even bothering to see the $10-$30 earrings right next to it. They just assumed that because this one piece (which took me 100+ hours to make) was in the thousands of dollars, everything else must also be out of their reach. Not so! Everyone always gravitated toward that piece, which costs about 80 times the average item price. 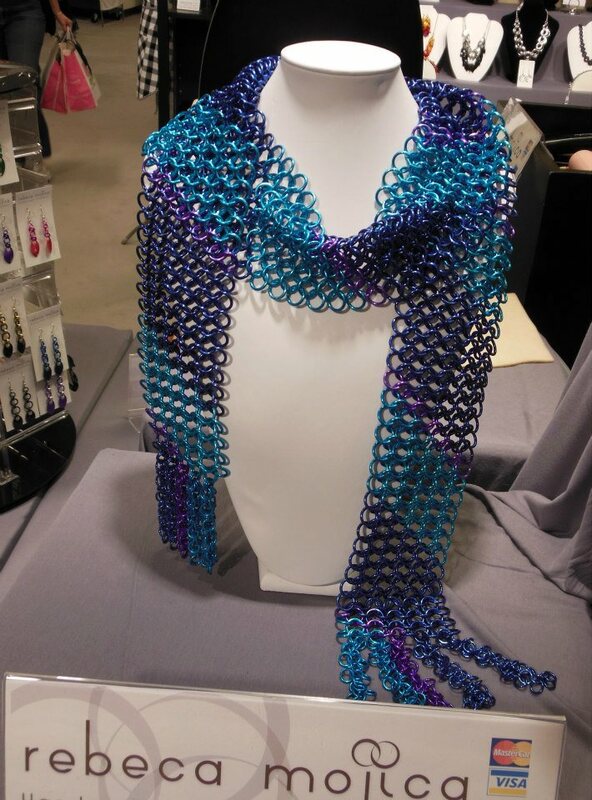 Replacing the expensive haute couture necklace at left with a more accessible chainmaille scarf caused people to explore my booth instead of immediately stepping back, fearing they couldn’t afford anything. So for my last couple of shows, I decided to position a different piece front and center. 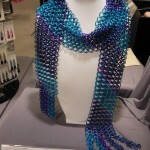 I put out one of my scarves, which retail between $350-$850. While these items are not inexpensive, they are still reasonable enough to people that they can expect that bracelets and earrings will be in their price range. It worked! People no longer walked away immediately after hearing the price of this one item. I still kept Poseiden’s Embrace in the booth, but put him further back, so customers had to walk past nearly all of my other inventory before they encountered it. By the time they got there, they’d seen dozens of pieces from $10 – $300, so they know that this piece was special and extraordinary. For a few years I had small acrylic signs, in which I printed up some information about the metals I use, and positioned the signs near the appropriate metals. Problem was, I only saw a few folks reading them, and LOTS of folks asking “what metal is this?” So I knew my system wasn’t working. So for my last show season, I put out tiny signs that, in very clear lettering, displayed the metals of the surrounding pieces. I had several such mini-signs throughout the booth. And frankly, I don’t know why I delayed so long in doing this! I could see people coming up to the booth and starting to ask, “Is that copper?” and then seeing the sign. Yay! And also, it was great that I didn’t have to explain 600 times, “No, the piece that looks like rose gold is actually bronze” and “No, that is not sterling silver, that is aluminum.” They could see the answer themselves, and I think they felt empowered getting that information without having to ask. No matter what medium you work in, there are likely lots of “frequently asked questions” you get from customers. Or your customers might not ask some questions because they don’t even know what to ask! By displaying answers, or pointing out things they otherwise wouldn’t know, you are giving them valuable information they can use in the purchasing decision, and they can get this information even if you are currently busy helping another patron. From the get-go I have always priced all of my work (except the show pieces), and I find this greatly minimizes me needing to spend time looking up prices or trying to memorize prices for the 100+ pieces in my booth. I’ve read that people are more likely to make a purchase when they can see the price. And it makes sense – if you’re busy helping someone, a potential customer could walk away if they do not see the price and do not want to wait around and ask. Even if you’re not busy, some people just don’t want to ask questions anyway! Try to keep your price tags neat as well as discrete, so your booth doesn’t look like little pieces of paper exploded all over everything (unless your logo is the coolest thing in the world). You may need to tidy up your price tags several times during the day. Also, it goes without saying, but be sure your prices are very clearly marked, and are bigger than you think they need to be. It may be uncomfortable for someone to ask for your help in deciphering a price that they can’t read, and you could lose sales. 4 – Have funky hair. 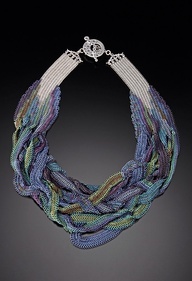 Or a totally awesome neck piece. Or just something that is going to get people to notice you in a positive way! This may seem like a very weird tip, but it seems to be true. For most shows, I’ll wear one of my chainmaille scarves, or a dramatic necklace and people nearly always comment. For a few years, I had deep red hair, and folks would often compliment my hair. That is, they used to comment on my hair until I had a helper with vivid purple hair! I was amazed at the number of people who came up and commented “cool hair” or otherwise started a conversation with her. Literally, at least 6 people per hour would come up to us and say, “Wow, great hair!” So that is about a person every 10 minutes, coming up to the booth and complimenting us. Of course there are other people coming up to the booth, most of whom are commenting on the jewelry … but still, any way you can get people to come up and say something to YOU rather than you initiating the conversation, works toward your advantage. I think this is especially true if they are talking about something creative or artistic, which dyed hair is. You also want to be sure that you won’t ostracize your most conservative customers. I often put myself into the shoes of my various customers and do my best to choose a conversation starter that will communicate to people that are more like me, “Hey, I’m like you!” but not make me unrelatable to more conservative clientele. I’ve actually found that, by walking this line, some of my more conservative clients live vicariously through my fashion statements. Maybe it’s something they wouldn’t do or wear themselves, but they still like it and by purchasing my work, they are buying into that personae in their own way. When they wear their Rebeca Mojica jewelry, they are putting on that purple hair or wild necklace in their own way and that’s pretty cool! 5 – Ask an open ended question to everyone who walks by. A good rule of thumb is to smile and say hello to everyone who walks by. But I’ve found it is even better to take it one step further and get ask them a question that will make them engage with you. I sometimes say, “Have you seen chainmaille before?” “Do you know chainmaille, or are you just drawn to pretty shiny things?” etc. Either way, though, customers likely have faced dozens of vendors who either didn’t great them, or who just greeted them by saying “hello.” Find something memorable to say to them: engage them, get them smiling and be unforgettable in the most positive way! I gladly create custom work, and I also have more colors available for most pieces in my booth. Yet customers don’t know this unless I tell them. I had thought this was fine – I figured it gave me a chance to interact with customers to let them know that they could purchase this necklace in red, or that bracelet in blue. It is clear that customers don’t automatically assume that there is more inventory available. They often think that what is out, is it (and this is certainly the case at some booths, especially those that specialize in one-of-a-kind designs). Whenever I told someone I had additional colors and sizes, they were like, “Oh, wow, that’s great!” and about a third of the time, asked to see a particular piece in a different color. Though I did get a few sales from doing so, I feel as though I lost more sales because of the times when both my helper and I were busy with customers, so we couldn’t shout out, “More colors available!” to the folks who were browsing. So next year, I’ll put out a couple of signs next to my most popular pieces, and will see how it goes! 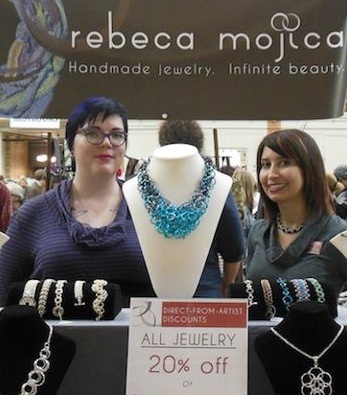 This article is part of Blue Buddha’s series: Behind the Scenes at a Craft Fair. 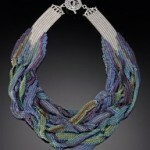 12 Comments on "5 Ways To Boost Sales At An Arts & Crafts Show"
Great info. I will use this for my upcoming show. As a show veteran myself, I have two tips that help, especially if you’re busy with customers and still trying to draw people into the booth. Have a bowl/ basket/ what have you of individual pieces of wrapped candy (I use Hersey’s Kisses or appropriate holiday goodies) with a sign that reads “Free Chocolate, Take One”, people come for the candy, and stay for the jewelry. It is a silent “come hither” and many a show goer will pop in because they want a piece. If you have a booth buddy you can also do a small project on the side, while sitting in the booth, I find many folks come in to see what I am doing and will stay to shop or converse about the piece I am working on, being knowledgeable and “showing you work” not just the finish pieces can drive sales as well. This is all helpful information. I am just starting out and need all the help I can get. I can make art, I just have a difficult time at pricing things…. Glad it was helpful! Check out our article on pricing your jewelry – http://www.bluebuddhaboutique.com/b3/faq/crafters/pricing-your-crafts We’ll be creating an updated blog post at some point about this subject, too! Thanks for the tips. One more that I like to see going to any kind of show is, actully be making a peice. It draws a lot of attention. Excellent point! People love to see “the process” behind the art, and often are surprised to discover everything involved, which adds more value to your craft.